Victorian houses provide an abundant supply of eye candy when admiring their intricate gingerbread trim and interesting roof angles. If you’re a fan of this historic architecture, you don’t want to miss this round-up of exciting homes. Photo by Klassen Remodeling & Design, Inc. 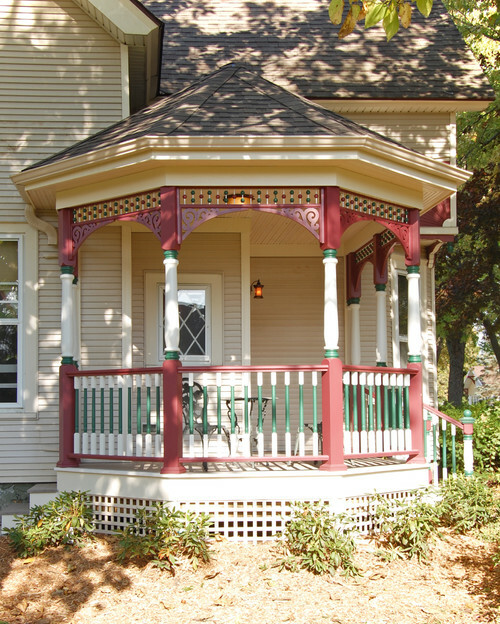 Whether small or large, Victorian houses are crafted with numerous details. 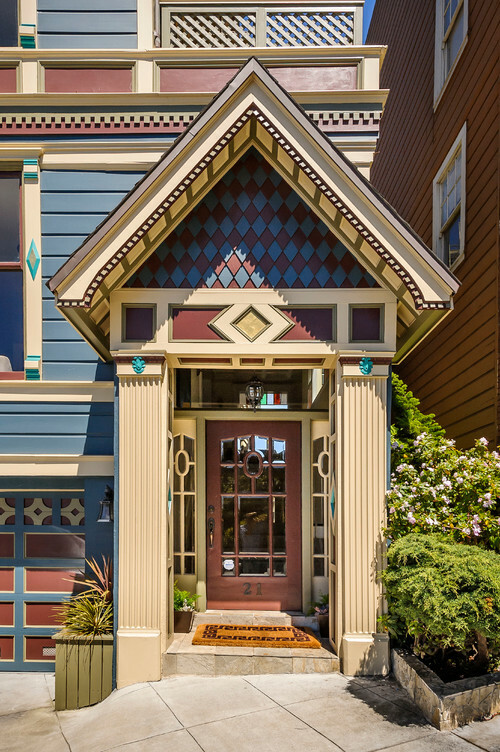 No one ever seems to say, “Oh, this house is too small for all those details and colors.” This small charmer includes fish scale trim, dental molding, bow windows, garland trim, and more. 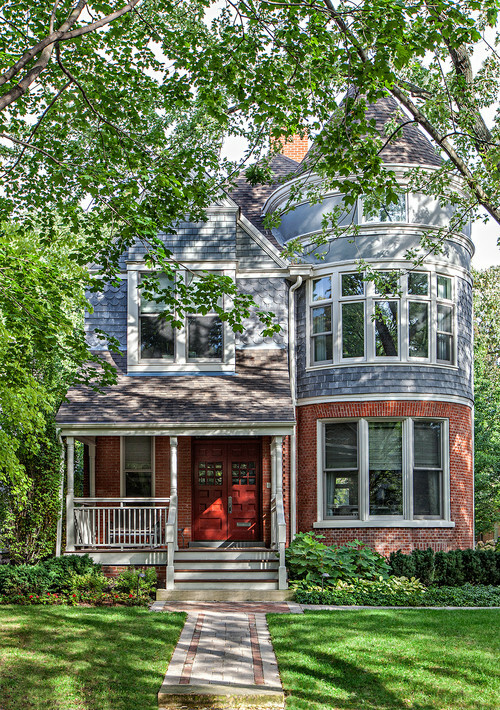 Photo by Cardea Building Co.
Lucky is the homeowner who possesses a beautiful turret. The circular expanse of windows provides every angle of outdoor views. 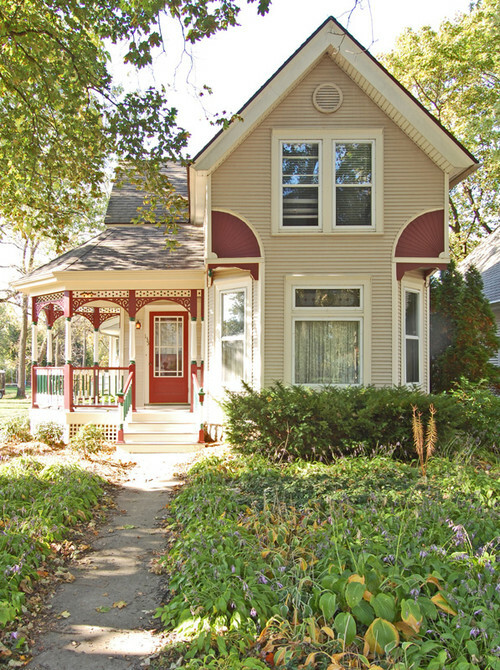 Victorian houses are perfect for punching up exterior color. 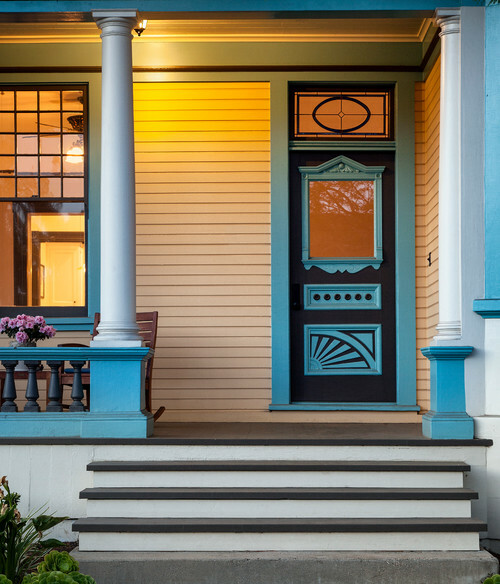 To highlight trim, owners paint a variety of colors to showcase architectural details. 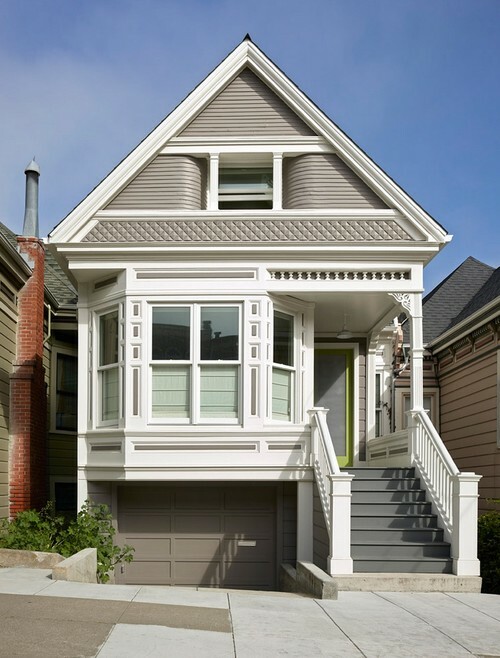 A gingerbread home is great for choosing exterior colors not typically seen on other homes. 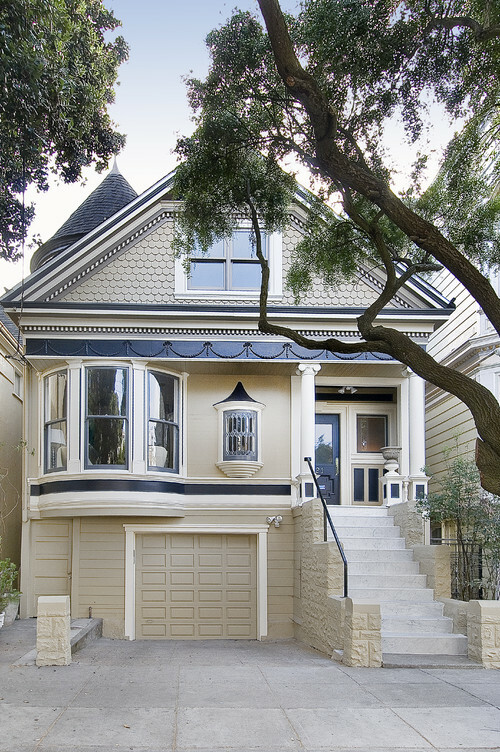 If bold color isn’t quite your style, Victorian houses also look pretty with subdued color in the same family. 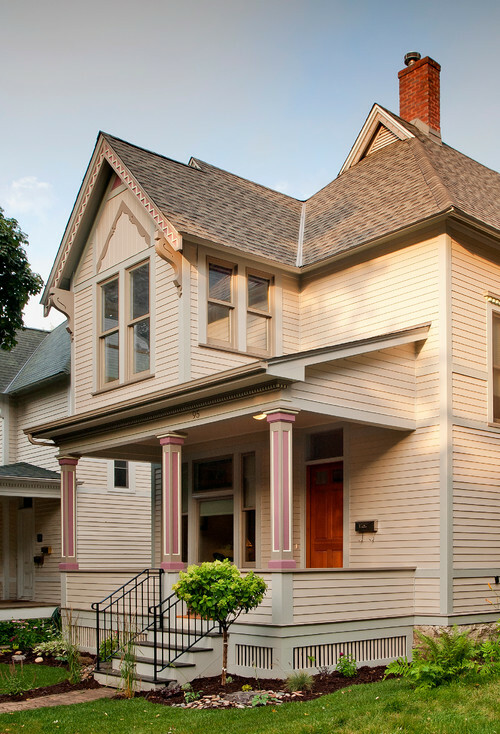 Here, pink, cream, and tan are used beautifully to highlight trim work. I read an article the other day that said when it comes to decorating styles, Victorian decor is the most-searched style in the Midwest where I live. I guess that’s not too surprising considering the abundance of Victorian architecture in our area. How would you like to paint this house? 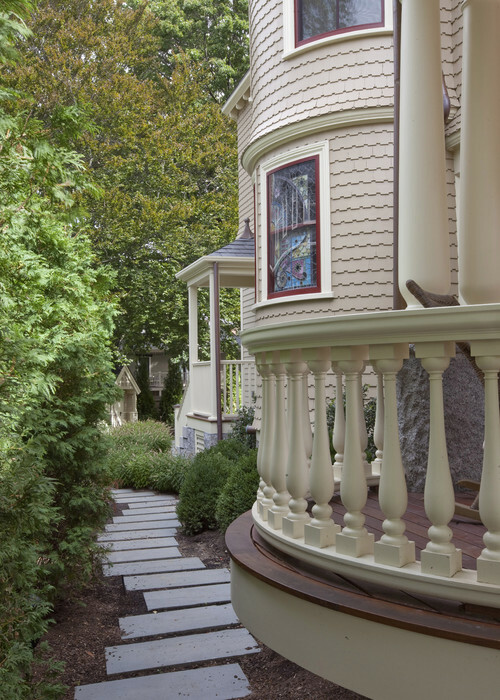 Every detail of this turreted home is called out with contrasting paint. This house is more than a home – it’s a work of art! This home pairs brick with shingle siding and fish scale trim for a unique look. Photo by Faith Kiehart Design Inc. It would take me forever to choose color for a painted lady. I speak from experience. It took me months to finally decide upon the exterior palette of yellow and blues for my Victorian cottage. It’s nice to see Victorian elements on a newer construction home. Photo by Peter Cadoux Architects, P.C. A quaint little cottage like this would be perfect for my retirement home. The town where I’ve seen the largest collection of Victorian houses is Galena, Illinois. Have you ever been there? It’s located in the northwest corner of the state and many of the historic homes have been turned into Bed and Breakfast lodging. Even a front door has amazing detail that needs to be called out with paint. 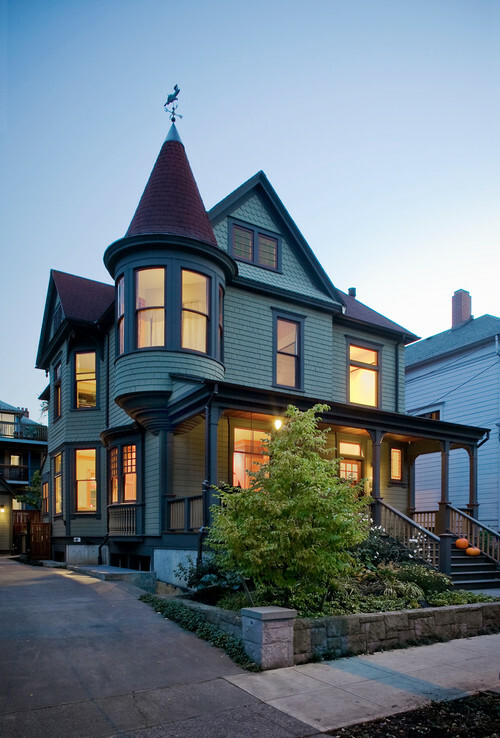 Are you a fan of Victorian architecture? I find every detail fascinating! … how lovely … each in there own right … doll houses come to life ! Each one different from the next and yet every one absolutely beautiful! 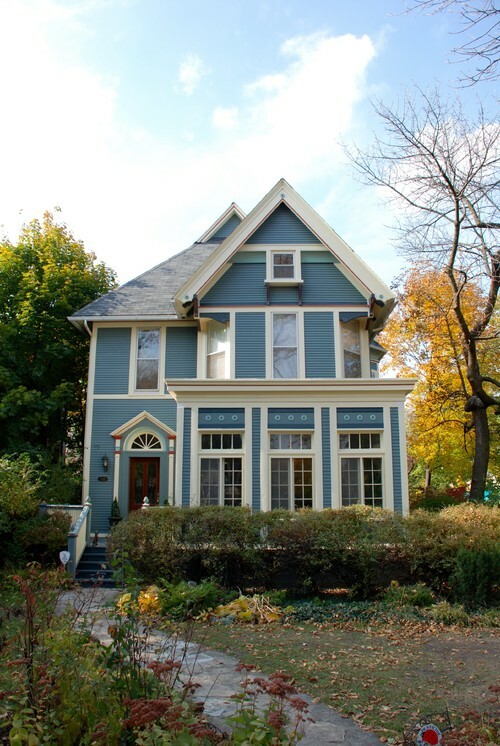 Wonderful post – I absolutely love Victorian style homes. 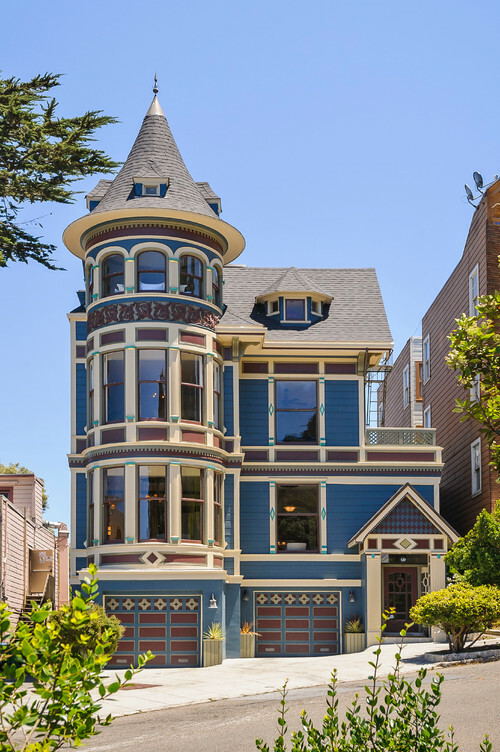 The home with the three story windowed turret is something I have not seen before – it’s amazing.. I really like the Victorian style home, however , for some reason I don’t care for the ones that have all the diamonds and details painted on them. They remind me of a circus. Victorian homes have so much character and charm & I would love a small one for a retirement home also. This is truly a tour of art and love, for surely it would take a true artist to draw and build one of these beauties. Thank you i enjoyed and could look all day. Beautiful homes. Very first, the one before one with the detailed turret are my favorites. You are right about the house with the beautiful details, work of art. I can so appreciate the artistic value in the painted features of a painted lady Victorian home, but sometimes the all the detail is too busy for my eye. I do love your “retirement” Victorian. Not too much detail there and much more my style. Yes, I could definitely live in and love that one. My husband and I took a little road trip to Galena this past spring, and I was in my happy place with all of the historic buildings and the museum’s. I highly recommend it. I’m going to be “that person” and correct you on one thing… it’s “dentil” moulding, not “dental”! A common mistake and understandable seeing as how it does look like teeth. Or maybe your spell-check changed it on you? All are beautiful! I would love to live in one. Our small town has a few, but they never sell!